Poetry State Forest – loudlatinlaughing – Euge! Euge! 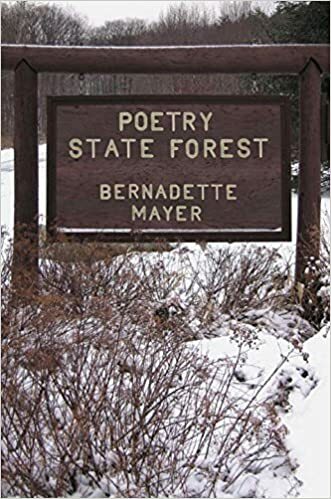 Bernadette Mayer strikes again, playing with words, showing you her old notebooks with lists of words, creating poems out of daily life that reveal bits of herself: her fights with Phil, presents from her son Max, the neighbor who buys the land next door to put up a cabin (“At least it’s not a walmart/a used care lot or a mine”), railing against George Bush (W), going to anti-war demonstrations, talking about the gloomy month of December. My favorite one was “Idyll,” written from the perspective of a know-nothing typical redneck white male who’s vacationing by the lake, dousing his bbq with lighter fluid, fishing, tossing his cigarette butts in the water, then throwing more of his garbage in. Mostly it’s a book of play, words dancing and pirouetting and bowing and scraping across the page.